I too find that individual tartlets are prettier and easier for portion control. These little tarts look very beautiful and delicious, Jean. Thanks, Angie. Yes, portion control is important as well, since I like to keep track of my sugar intake. Those look tasty! You are so talented :) Thank you Jean for sharing this post at Wednesday AIM Link Party at Grammy’s Grid. I shared it on social media. Hope you get lots of traffic! 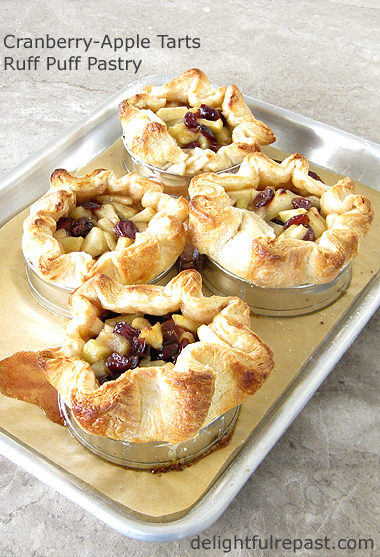 These rustic tarts look fabulous. Thanks, Grammy Dee! And thank you for sharing on your social media! Ellen, thank you! I'm making another batch today as I have a friend coming for tea. Crumpet rings? Sounds like something Mr. tyrannosaurus Rex would use to propose to Ms. Tyrannosaurus rex. Hmmm. 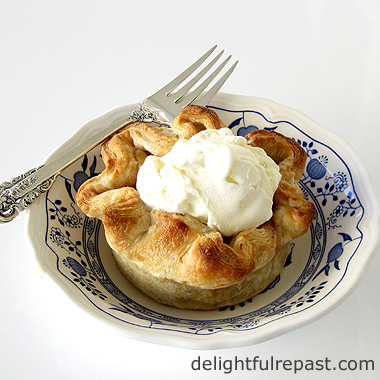 OK…I’m having a special today on “apple pie rings” that are sure to make Mr. Delightful ooh with admiration. Never mind that these rings say “Folgers Coffee” on the outside of the rim, they were forged by the little people in my native village of qwzqtselpulaezzqvmnwiiotslwjahjfdegerqey, Ireland, and passed down through billions of years of family generations. Or maybe not. In any case, my favorite fruit is ice cream. Oh, Sully, you're too funny! Now I'll picture my crumpet rings on a T Rex every time I use them! I feel so charmed by your little lovely pies, they're surely delicious, honestly this wonderful blog of yours is such a precious source to me, you really feed my passion for cooking, my dearest Jean, thank you ! O my these look so very yummy. I will pin this for sure! Amazing as always. Dany dear, thank you so much. And *your* wonderful blog feeds my passion for history! Can't wait to see what I learn next! Suzie, thanks! I so appreciate Pins and SM shares of all kinds! These look so tasty! I've been reading that the recent weather may have damaged peach and blueberry crops here in the south. I sure hope not! Mildred, thank you. And I sure hope you'll be able to have some peaches and blueberries! I'll be making these tarts with peaches and blueberries just as soon as I can get my hands on some. YUM! I'm a fan of any dessert combining fruit and chocolate together. Thanks, Margie. I don't get in the mood for chocolate very often, but I do like the combination of chocolate and orange. They are almost to pretty and perfect to eat! I've pinned this one and can't wait to try it. Thanks. Just love the combination of alliteration, assonance and rhyme with a touch of single vowel, punchy, presentation, here Jean. Oh and I like puff pastry. Its like eating a cloud!!!! !These sound delicious, Jean. These look so beautiful and have some of my favorite flavors! Delicious! Lucky me! I do have English Muffin rings because we make English Muffins. Those tarts are adorable and to tell you the truth, I think making individual tarts look so special. Put them on a pretty plate. *sigh* Perfect. Thank you for the inspiration!! I wouldn't have thought of using my rings for this. Have a great weekend. Sugar, thank you. I hope you'll try them soon and let me know how they turned out for you. Tony, thanks. I didn't know I was doing all that! :-) And "like eating a cloud" - wish I'd said that! Marisa, thank you. And I'm glad to hear you have muffin rings! I love making English muffins (and crumpets), but haven't made any in a couple months. Kitty, thanks. And the grands would have fun helping you assemble the tarts or turnovers! Hi Jean, Happy St. Patrick's Day! These look good -- if I didn't already have my Irish fudge and ice cream going for tonight I'd give them a shot today! After being on the road for a week, it's always good to get back in my own kitchen! Thanks, Jeanie! And you are so right about getting back in your own kitchen - I tire of eating out real quick! Your "hurry up puff pastry" is very similar to my recipe. You won't believe this, but yesterday I was talking to a friend about wanting a recipe for apple-cranberry pie. And here you are, Jean, fulfilling my every wish! Aw, David, that's sweet! I've made it several times lately - just in a cranberry-apple mood. Oh yum. I'm saving this recipe for sure! Thanks, Richard. I do think you're going to like it! Karen, thank you. Ooh, yeah, dessert for a dinner of roast pork - wish I was having that tonight! Jean, these look really yummy. My favorite fruit dessert is strawberry shortcake, followed by berry cobbler. Thanks for visiting my blog and leaving the nice comments. Happy weekend! AJC, thank you! And your two favorites are two of my own favorites as well. Hi Jean -- I don't own muffin rings, but I do have four nonstick petite tortilla bakers (black) ... I wonder if these would work for the tarts? They flare from bottom to fluted top. I love the recipe, so I think I'll try it using the bakers. I'll let you know, 'k? Thanks, Nickie! Yes, I'm sure those will work. Let me know how it goes. Annette, thank you! Love the Dream Team! What a lovely dessert! I bet they are delicious. I love single serving desserts. Thank you, Adri! Single servings often look tidier, I think. Jean, thank you for dropping by and saying hello on my blog. I would love to share a cup of tea and my tea cart too! Your little pie/tart looks so tempting! I would say that peach pie is my favorite. Thanks, Gina! Peach is my absolute favorite, too! Jean anything with apples makes me happy. I can't wait for fall to come around so I can go apple shopping at our local farmer's market. This recipe is perfect for apple and any other kinds of fruit. And the individual size makes them all the more enticing. I love individual tartlets like this, Jean, and your pastry looks just beautiful. Cranberry and Apple make a lovely combination. Thank you for sharing with us at Hearth and Soul. Share on the Hearth and Soul Facebook page. Mary, thank you. I feel the same way - I eat apples nearly every day of the year that domestic apples are available. Thanks, April. I love making pastry, almost as much as I love making bread, maybe more! This looks delicious! I ahve to try this for my mum as she would loveeeeeeeeeeeeeeeeeeeee this! Thanks, Susana! And do let me know how you and your mum liked it! These look wonderful, Jean. We love apples and cranberries so I will be trying them soon! Amalia, thank you. I hope you like them as much as we do! Dear Lily, soooo good to hear from you! Thank you, and do let me know how they turn out for you. Hope you're staying cozy! Nicola, thank you. 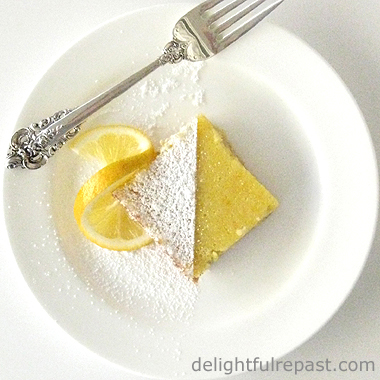 I've not yet posted GF puff pastry, but here's a link to my gluten-free pastry recipe. http://www.delightfulrepast.com/2010/11/pumpkin-pie-with-gluten-free-pie-crust.html It would definitely work for mini tarts. Apples and cranberries - yum! These look delicious! I always think mini/individual portions of desserts make them a little more special. :) Thanks for sharing with Awesome Life Friday. Lynda, thank you! And I agree, individual portions might take an extra few minutes, but they do seem a little more special. 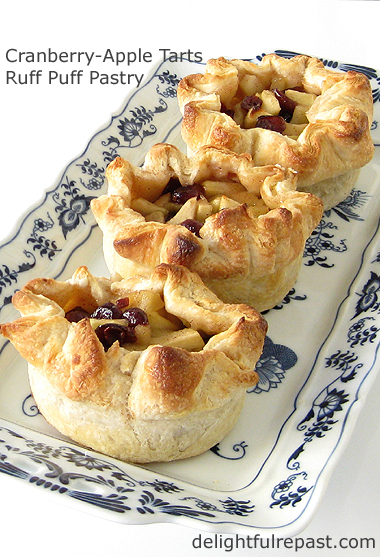 Wow!These individual tartlets are so pretty and look delicious. Thank you, TRT! Ohhhh, plum! Yes, as soon as plum season is here I'll be making these with plums. Perfect for a fall tea party!!! Thanks, Bernideen. Yes, especially when made just a little smaller!